If you are interested in England's Heritage you will be delighted with a stay in Suffolk! A visit to many of Suffolk villages or towns is certain to reward you with sights of ancient houses, castles, town halls, factories, barns, parish churches and bridges, to name but a few examples. The same range of heritage architecture can be seen in these Suffolk Hotels with history, but in this case visitors are able to get a up-close view of these buildings, rich in history and lovingly restored, by actually staying overnight in one! 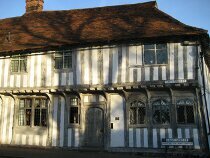 The Great House can be found in the marketplace of Lavenham. It was built during the wool trade but appears more Georgian than Tudor from the outside due to extensive renovations in the C18th. The great House was a private house in the 1930's until it was transformed into a Boutique hotel in 1985. 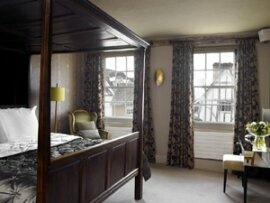 The five en suite bedrooms are light and elegant and still retain the historical charm of the house. 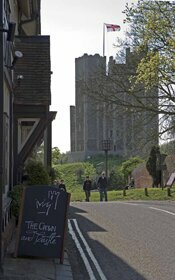 Situated in the peaceful village of Orford, The Crown & Castle is a 19-bedroomed hotel. The building dates back to the C16th but, due to an act of architectural vandalism in 1896, it is not presently recognisable as such. There has been a hostelry on the site of the Crown and Castle for eight centuries, and it is thought that the original inn was built into the walls of the C12th Orford Castle, but is now separated from it by a little lane. Many visitors enjoy a drink on the terrace during the summer, as the sun sets behind the castle. The breath-taking Hintlesham Hall a Grade 1 Listed Elizabethan Manor House, nestled within 175 acres of rolling Suffolk countryside. The C16th building is distinguished by its Georgian additions, most notably the famous façade, and by earlier Stuart interior embellishments. The Hall has 33 bedrooms and suites of varying shapes, sizes and styles enhanced by fine fabrics, works of art and antiques which abound throughout the hotel. Hintlesham Hall is extremely well placed for exploring Suffolk's 16th century wool merchants' villages, pretty river estuaries and Constable Country. Long Melford and Woodbridge are close by, with their numerous antique shops, and Hintlesham Hall also offers a perfect retreat for those who wish to go nowhere at all. Visitors are invited to 'discover Rustic Chic' at Tuddenham Mill, a stylishly converted watermill. From its exposed beams and water wheel to the contemporary elegance of the bedroom furnishings, Tuddenham Mill brings together a unique mix of influences to excite the senses. Like the Mill itself, the area around is a unique and vibrant mix of the historic and the contemporary. Visit nearby Newmarket, the 'home of racing' or experience the traditional market town of Bury St Edmunds with its stunning cathedral. If you are a fan of nature, Tuddenham Mill is the perfect location. The Brecklands and Thetford Forest are close by, as is the unique stillness of the Fens with their waterways, rich wildlife and idyllic views. As you can see, there are many options available to you when seeking Heritage Short Breaks in Historic Suffolk Hotels - we look forward to welcoming you to Suffolk soon! 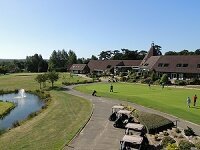 Please send us reviews of your favourite hotel for an English Heritage Short Break by Sending Us an Email.